This process is performed within a 24-hour turnaround time for each case. This includes any and every case our front-line coders are not confident with. 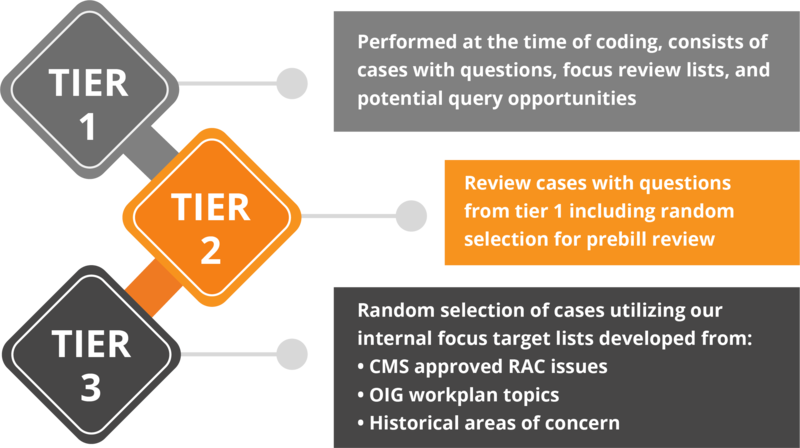 This involves every case the coding teams have identified questions on, including those in Tier 1. Focused Review List topics for automatic review. ECLAT Health Solutions provides our clients with flexible engagement models whilst ensuring a high level of visibility throughout the process. A combination of our global delivery model, medical domain experience, healthcare market knowledge and customer focus provides our clients with superior services at all times while entailing a reduction in total cost of delivery by over 30%. Our collaborative engagement models offer flexibility in the degree of control our clients wish to retain over their project while we work on smoothly transitioning the project. From Part Scope to End-to-End service, from Revenue Share to Fixed Price contracts, Service Level Agreements (SLAs) with built-in clauses for continuous improvement of processes – our endeavor is to enhance productivity and client satisfaction at every stage. At ECLAT, transition management is a step-by-step process with a strong focus on ensuring that the transition of all projects is on-scope, on-time and on-budget. Every client will interface with an ECLAT Transition Manager who will work closely with the client team to facilitate a smooth implementation of the project. As an international provider of healthcare revenue cycle related solutions and services, ECLAT ensures absolute compliance with The Health Insurance Portability and Accountability Act of 1996 (HIPAA) as well as The Health Information Technology for Economic and Clinical Health Act (HITECH). All of our employees attend bi-annual training sessions that outline our privacy and security standards. No patient information is allowed to leave our offices. Multi-tier security system for our intellectual property and confidential information. 24/7 security guarding our coding facilities as well as electronic access restrictions to our work areas and network. Built in firewall and restricted internet access. Access to servers is monitored by ID swipes so that this activity can be logged and reviewed on a daily basis. All external drives such as the CD drives and USB drive ports have been disabled. There are no printers connected to any of the workstations to ensure that no patient information is printed and taken outside the facility. ECLAT is committed to staying one step ahead of the industry standards for the security and privacy of patient data. As a result, we are constantly monitoring the appropriate legislation and making required adjustments to maintain compliance.